Are Elderly Drivers As Dangerous As We Think They Are? There have been several reports looking into the issue of senior citizens behind the wheel. The common conception is that they are unsafe but recent findings are showing that is not necessarily the case. 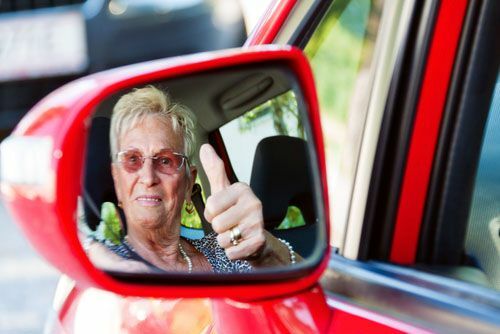 In a report by the Insurance Institute for Highway Safety (IIHS), it showed that even though the number of drivers over 70 has increased, fewer drivers 70 and older have been involved, injured or died in crashes from 1997 to 2006. There are several reasons for this decline. First, more senior drivers have the tendency to limit their driving. They also will no longer drive at night or in inclement weather if they can help it. Their trips tend to be shorter and less frequent. Also, they generally will try to avoid complicated intersections, like left hand turns against traffic. Another reason for the decrease in senior fatalities is older people tend to be in better health, both physically and mentally, than in the past. Other trends that have made the roads safer for everyone is the increase use of seat belts. Cars are also manufactured with many safety features, and the roads have built more left hand turn lanes. These lanes take judging speed and distance out of the equation. According to the IIHS, the use of roundabouts are favorable because they control speed and prevent head-on accidents. There are programs available to seniors such as AAA. AAA offers a self-rating form for seniors drivers. AARP also offers a driver safety program for drivers over the age of 50. A benefit to completing this program is a person can take their certificate of completion to their insurance agent and possibly receive a discount on their premium. As a Kentucky Accident Attorney, I know getting stuck behind a slow driver can be frustrating, especially when you're in a hurry. With all of these programs and changes, we can expect to see more and more seniors on the road. However, we need to try to remain calm. Respect them as you would any other driver.